Now that we have created a PolyLine Entities its time to Edit them. Where is Edit PolyLine option? By Double Clicking on PolyLine Entity : Double clicking on PolyLine entity will start Edit PolyLine command. Command Options are available at Command Line or You can use these option from Right click also. How to use Edit PolyLine Options ? 1. Close: If you have Forgot or want to Close PolyLine after creation then you can choose this option. It will close PolyLine Start and End point. If PolyLine is already closed then there will be no effect of this option. Note: If you edit Closed Entity polyline then Right Click option will not show ‘Close’ option . Smart ! 2. Decurve: You can Decurve any Curved PolyLine which consist of Arc Segment. No effect on Straight line segment PolyLine. 3. Edit vertex: This option will offer few more options to Edit Vertices. The name of options are self explanatory so we will not go into deep discussion of each option. BTW where is Delete vertex option?? To use Delete Vertex option run separate command EDITVERTEX in DraftSight. However Options under EDITVERTEX command are slightly different than Options under Edit PolyLine > Edit vertex. 4. Fit: This option change PolyLine into smooth curve which consist of Arcs joining each pair of vertices. Curve created with this option will pass through each vertices of PolyLine . 5. Join: This is very Special option of Edit PolyLine. Many will get confused as how to use this option. I will demonstrate this with following example. Suppose we have 2 PolyLine entities as below and want to Join them . Now from Command Line options Choose Join option. Or to can Change Join type Input JO and Enter. We will use option Extend as we have to extend to join both PolyLine Segments. When you see ‘Specify gap tolerance’ option then Click on End point snap of one PolyLine and then click on another PolyLine end point to Jon both polyLine segments. Make Sure Esnap is on with End snap checked to precisely select both End point snap. Now both polyLine segment will be converted into One PolyLine as above ! You can’t join closed polyLine segment, if you try to do so then command line message will be shown as below. You must select more than one polyline segments to add them with Join option. 6. Linegen: It is called Line generation. 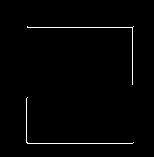 Command Line ask whether to use a continuous or dashed LineStyle around the vertices. This message is for non-continuous LineStyle. For continuous LineStyle it makes no difference if you select Yes or No. Confirm: Continue LineStyle patterns around vertices? Select Yes to Set lineStyle in fluent pattern around the vertices of PolyLine. Select No to set LineStyle to place breaks between dashes in LineStyles. This option is used very rarely . Tip: To change scale of Line use LINESCALE Command. 7. Spline: This will change PolyLine into a Curve (not actual Spline entity) by using PolyLine vertices as Control Point. Curve created with this option won’t pass through each vertices of PolyLine. 8. Width: This option will specify new width to whole polyline even though your start and end width are different.